During our March meeting, it was agreed that the best method of weather proofing the observatory dome and roof was the one put forward by Saul, ie. by applying a new fibre glass surface over coated directly onto the existing felt. Following the generous donation by Norman Wright and perhaps other monies forthcoming from the college, we should have enough funds to carry out the necessary work for the refurbishment. It has been proposed to start some work during the Easter holidays, with a view to carrying out the work associated with the dome and roof once evenings are light enough to do this. The work will have to be done in the evening Saul’s time, and weather permitting. Once we know definite dates, assistance may be sought from members to help out; similar to the refurb back in the early 2000’s. We will keep you informed. 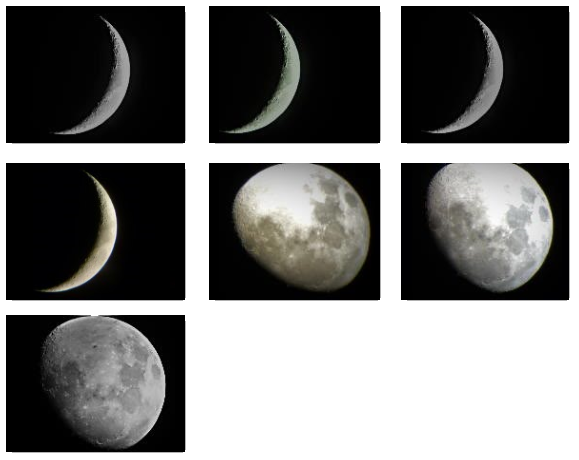 Images of The Moon taken simply with Mark's camera pressed to the telescope lens. 10-Mar-2019: waxing crescent images; 17-Mar-2019: waxing gibbous images.